Our Window Design Showcase provides the interactive techniques for you to be the architect of your own unique project. Choose from a wide variety of window products and configurations, room options, color options, and even grid and cut glass styles too. Transform an ordinary room into one you've always envisioned then print your custom plan for your remodeling or new construction project. 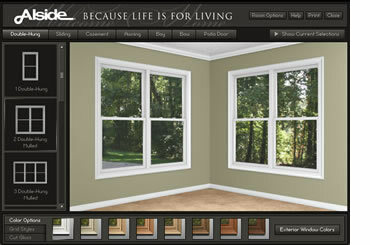 Click on the picture on the left to see all the window styles. Home Town Siding Co., Inc.